Internet on the Outstation provides a new take on the digital divide. Why do whole communities choose to go without the internet when the infrastructure for access is in place? 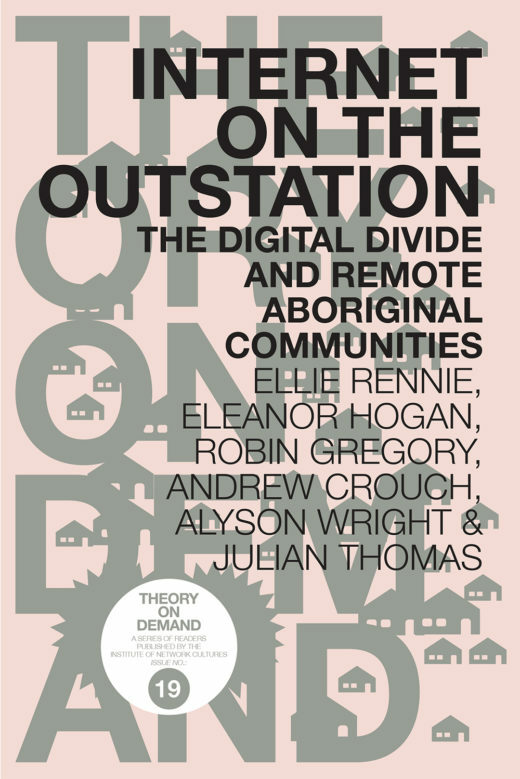 Through an in-depth exploration of the digital practices occurring in Aboriginal households in remote central Australia, the authors address both the dynamics of internet adoption and the benefits that flow from its use. The book challenges us to think beyond the standard explanations for the digital divide, arguing that digital exclusion is not just another symptom of social exclusion. At its heart, Internet on the Outstation is a compelling examination of equality and difference in the digital age, asking: Can internet access help resolve the disadvantages associated with remote living? Internet on the Outstation is the result of a multi-year research collaboration, which included a trial of internet infrastructure, training and maintenance in three small Aboriginal communities (known as outstations). During the research phase, Ellie Rennie, Eleanor Hogan and Julian Thomas were based at the Swinburne Institute for Social Research in Melbourne. Robin Gregory and Andrew Crouch worked at the Centre for Appropriate Technology, an Indigenous-owned research and training organization in Alice Springs. Alyson Wright worked for the Central Land Council, the representative body for traditional owners of the central Australia region. This resource has been moved to offsite storage for long-term preservation. To access this object outside of a participating library, please visit the related link(s), or make a request. Contact us to learn more about our library services.